Russian President Vladimir Putin teaches a high level Judo class. "When I am on a judo mat, I feel at home." Great Last Class of 2005 everybody! We're closed until the day after New Years Day, January 2nd. Have a safe and Merry Christmas and a Happy New Year, and let's get ready to train hard in 2006! Robber picks wrong victim, again. We're Open today for classes, despite the nasty weather, although of course, if the roads freeze in your area, please don't chance the drive. Here is a link to our Syllabus (right click, save as...) (.rtf format, .wps format, html format), which we work from in class. Note One-Steps, sparring drills and Ho-Shin-Sul supplements at the end. Please defend from rival ninja clans. Congratulations Sam McClain! 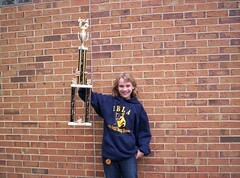 Sam won 1st place in Forms Competition at the Winter TKD Championships in Marietta on Saturday. Great Work!